The pilgrimage to Tomé Hill in Tomé, New Mexico is an annual Good Friday tradition. The Albuquerque area Easter week tradition is similar to the pilgrimage made in northern New Mexico to the Sanctuario de Chimayo, in Chimayo. That landmark draws thousands, many of whom walk for many hours--or days--to reach the Catholic shrine. It is said the Penitentes began the annual tradition to the Tome hilltop as a way to make penance for their sins. Many area Christians continue the tradition as part of Easter week, making special prayers at the hilltop shrine. Three crosses dot the top of the hill. Tomé Hill lies east of the Rio Grande and six miles south of Los Lunas. It lies about 15 miles south of Albuquerque, along the El Camino Real. The Camino Real, or King's Highway, was the path the Spanish soldiers took as they traveled from mission to mission, before New Mexico became a state. The hill lies along the Rio Grande rift, an ancient geologic uplift that is a unique feature, and of which the Sandia mountains near Albuquerque are a part. 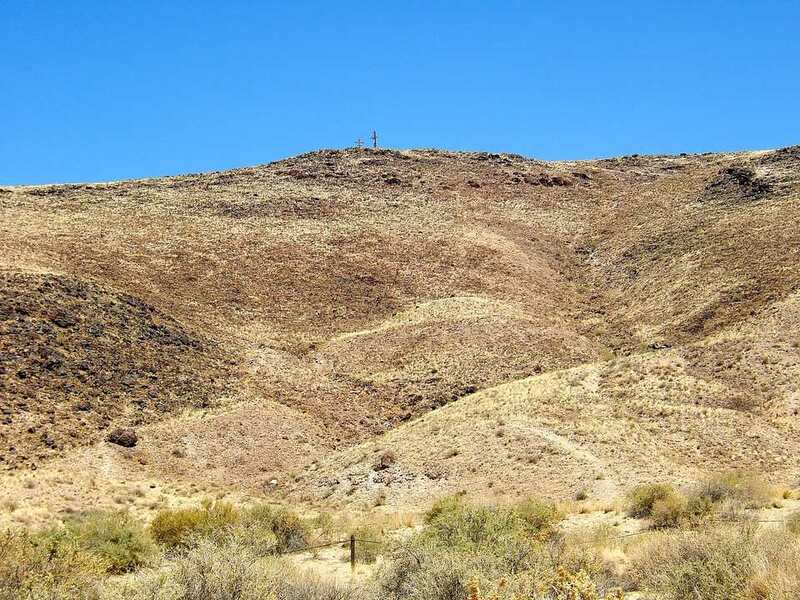 The geology of New Mexico is unique, and Tomé Hill stands out as a large hill in a rolling valley. More than 1,800 petroglyphs have been recorded at the hill. Some date back thousands of years. At the base of the hill, there is a small park with statues and plaques explaining the area's place in history. The park's large steel sculpture, La Puerta del Sol (Gateway to the Sun), reflects the area's diverse cultures. On Good Friday, people walk from the base of the park to the top of the hill, a walk that takes a good 30 to 45 minutes, or longer, depending on how fit the pilgrim may be. There are two paths, the steeper grade, or the less steep grade, which many pilgrims take. The hill has about a 350' elevation, and once you get to the top, the views are spectacular. Many people make the trek from further away, but some come and park their cars near the bottom of the hill. The parking area is small, and so for 2011 the area's neighbors met with local officials and came up with a new set of rules. Two roads in the vicinity of Tomé Hill will be closed and monitored by local officials. Vehicle traffic was a problem in the past, and the road closures will help provide a solution. Tome Hill Road at N.M. 47 and La Entrada at the base of the hill will be closed to traffic. Irrigation ditches will be barricaded as well. Those who make it to the top of the hill will see the three crosses that have stood at the site since the late 1940s. Many pray. The annual pilgrimage is heavily attended. Anyone who plans to go should wear sturdy hiking shoes, a water bottle and should dress in layers. There is no shade. Take N.M. 47 (El Camino Real) south from Albuquerque to one of the churches or schools listed above. The hill lies east of 47 near the Immaculate Conception Church, which is highly visible from 47. The walk will take 1.5 to 2 hours to the hill, another 45 minutes or so from there to the hilltop. From the church, take Patricio Road east to La Entrada. Take La Entrada north to the hill.